The downtown drag is full of amazing, locally owned stores! There is everything from flavored olive oils, handmade soaps, children's and adult boutiques, interior design, and jewelry. A few shop owners are in the family so make sure you check out Barbara's and Suga Babies! Local Coffee shop with pastries to get you going in the morning! Enjoy Bardstown nightlife with craft beers or choice bourbon at our downtown bar. You can run, ride, hike, picnic and more through Bernheim's large grounds. One of our favorite things to do is head onto the trails, which range from .5 miles to 13 miles, with our pups. They have educational events and group hikes which are listed on the event calendar on their website. 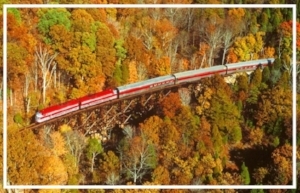 The Dinner Train is a unique way to see Kentucky's landscape while enjoying a meal! They have special tours including a murder mystery and bourbon experience. Learn more about the ghost activity in Bardstown with the very enthusiastic Patti!